The US Navy in the Civil War and After . 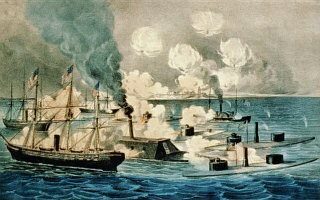 The American Civil War of 1861 – 1865 threatened the very survival of the nation and imposed a crucial wartime task on the United States Navy. 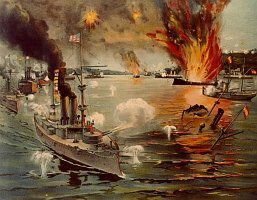 The Navy, also known during the war as the Union Navy, was ordered to blockade the entire Southern coastline to prevent Confederate cotton export or receipt of munitions and trade goods. To accomplish this goal, the Navy expanded from 42 to 670 ships and seized major Southern seaports from Virginia to Texas. at Mobile Bay in the greatest naval battle of the Civil War. .,.v One very hard-fought battle occurred in August 1864, when Rear Admiral David Farragut forced his way past Confederate forts to take Mobile Bay, Alabama. As enemy resistance stiffened, Admiral Farragut led his ships with the valiant words, "Damn the torpedoes! Full steam ahead!" The Navy fought several dangerous rebel commerce raiders and blockade-runners throughout this blockade. 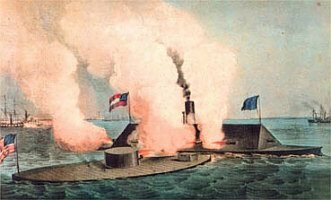 Military engagements occurred between Confederate raiders, monitors and even primitive submarines. Bombardments of enemy forts and amphibious operations to liberate enslaved regions also punctuated this prolonged and difficult, but ultimately successful, Navy blockade. Virginia, in 1898. ........ Following the Civil War, the Navy embarked on a naval revolution that slowly transformed the old sailing fleet into armored steam squadrons. These squadrons were rearmed with rifled guns and refitted with other major technical advances. The long period of peace relegated the new warships to patrol duties and international cruises to shield growing American sea commerce by showing the flag in foreign ports. However, many obsolete ships remained in service because of paltry funding for newer designs. Steel warships of advanced construction were not authorized until 1883, which marked the beginning of the “modern Navy”. 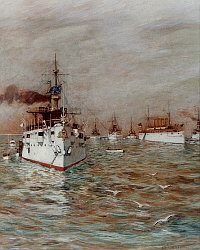 The modern and well-trained Navy won resounding victories over obsolete European adversaries during the Spanish-American war of 1898.
in destroying the Spanish fleet off Cavite.